Howdy! 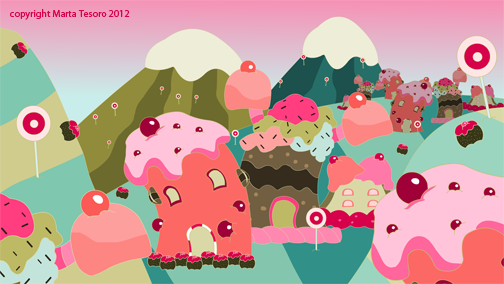 So we've started our final project in Maya and I've decided to do an environment design and I've opted to do a candy world of sorts. I am required to do a back story for my background and so I've come up with the idea that the town is all edible and that Sugar Bunnies live here and they entice children to stay with them for a little bit. The bunnies fatten up the children and then eat the children. A cautionary tale of greed. So it's Dr Seuss, Charlie and the Chocolate Factory and Hansel and Gretel kinda rolled into one. I did this one really quickly in Flash today at school while finding reference images and trying to figure out a colour scheme. I need to do more work still though...and perhaps try out other building designs and palettes.